When I took the class on family therapy in grad school, I fell in love with the visual language of genograms. Since making this genogram chart at the start of that course, it has been one of my most shared sketch notes across multiple platforms. Scroll to the bottom of this post to purchase a printable PDF of this genogram key. Genograms are like a family tree, except instead of focusing on genealogy genograms focus on relationships, behaviors, and the transmission of patterns through our family tree. 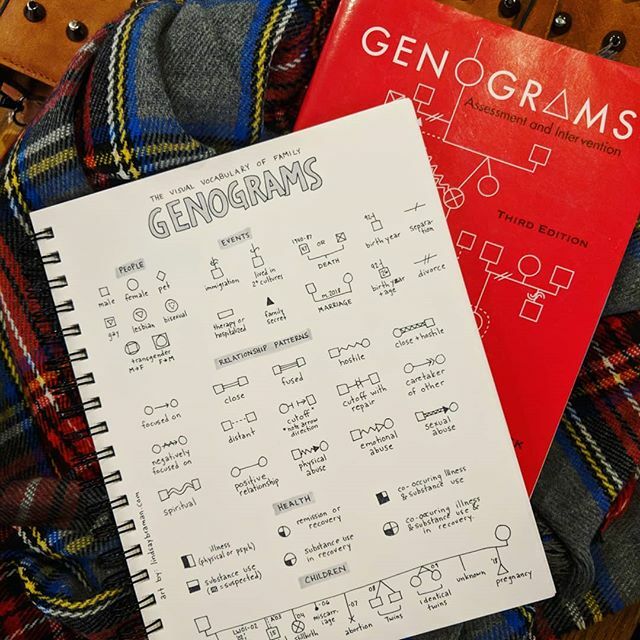 Because they can help us understand how certain relationship patterns, behaviors, health problems, and addictions are at least partially shaped by our genes and relational environment, genograms are a valuable tool in psychology. 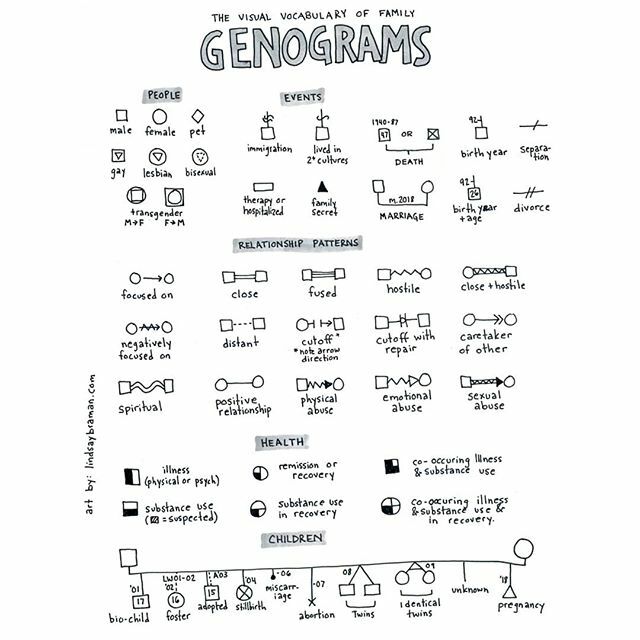 Most popular in family therapy, they can also be used by healthcare providers and individual therapy, genograms can help individuals visualize the patterns of their families of origin and learn new things about themselves and their family. Learning the symbols of genograms is the first step towards using and understanding your own and others’. One thing I appreciate about genograms is that the genogram can be very flexible. While there are some standard symbols, many illustrated in this chart, genograms can be adapted in countless ways. Genograms can be developed for an individual specifically to track things like addiction, cancer, emotional fusion or cut off, psychiatric disorders, and more. It can even be used to track far more seemingly random events through generations, like religious devotion, miscarriages, sexual abuse, teenage pregnancy, or just about any other behavior. In America we are especially individualistic, and often forget how influenced we are both explicitly and implicitly by our ancestors. The genogram is a helpful tool to help us notice patterns, and in the noticing be empowered to make more informed decisions about our own behaviors. I think talk therapy has incredible value, but for visual thinkers I believe it is valuable to integrate visual aids. Seeing something tangible that has only been discussed in the intangible can bring clarity for many individuals. While art therapy offers a more visual approach, art therapy can be bound to the visual-emotional and can be off-putting to individuals who don’t identify as an artist. Genograms can serve as a bridge between the seen and unseen, accessible to artists and non-artists. The visual language of Genograms concisely represents the complexity of relationships and intergenerationally transmitted issues. If you are interested in learning more about genograms check out Genograms: Assessment and Interventions (by Monica McGoldrick, Randy Gerson Ph.D., and Sueli Petry Ph.D.) aka the Genogram Bible. 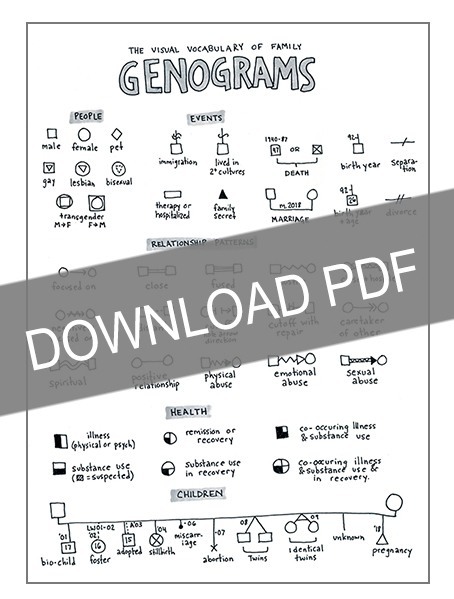 This sketchnote version of a genogram symbol key is now available via the links below. Through partnership with twistednotions.com, you can purchase this PDF and instantly download upon completion of checkout for 99¢. My art gets made thanks to patrons who choose to support the creation of psychology related art and sketch notes through $1, $5, or $10 monthly donations. In exchange for this patronage, supporters receive access to printable PDFs of my work, including this genogram symbol key.